He received honorable mention as Air Force Times’ service member of the year, and now Master Sgt. Joseph Brownell has made headlines once again. 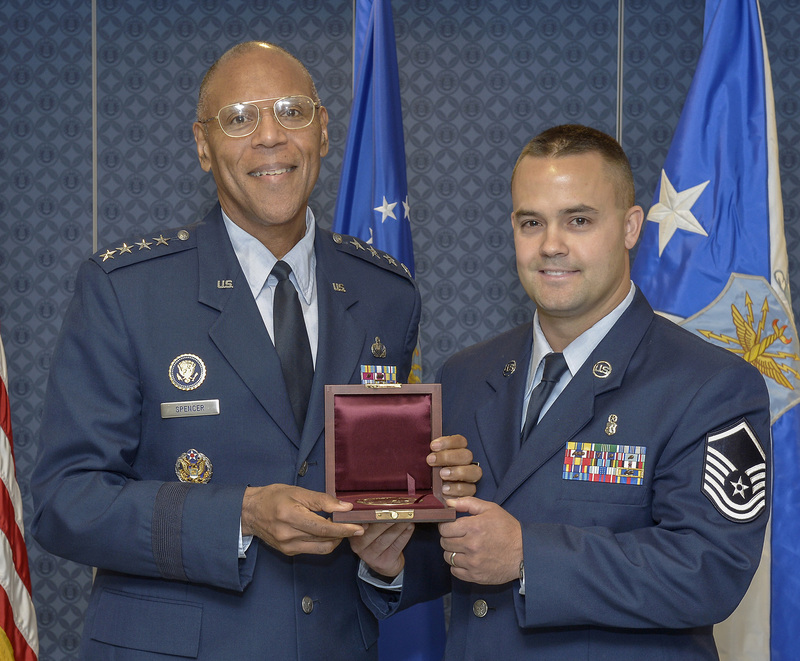 Brownell and a fellow airman received the 2011 Cheney Award Nov. 1 in a ceremony at the Pentagon. Air Force Vice Chief of Staff Gen. Larry Spencer presented the award for a search and rescue mission on Mount Stuart, Wash., on Aug. 20, 2011. Capt. Kenneth Green, an evaluator UH-1N pilot assigned to the 512th Rescue Squadron, and Brownell, a field operation section chief with the 336th Training Support Squadron at Fairchild Air Force Base, Wash., saved the lives of a civilian and his son after they suffered acute mountain sickness while climbing the 9,000-foot peak. Green executed a 200-foot hover and lowered Brownell down to the climbers. Brownell then stabilized both people and sent them up the hoist. Near maximum weight, the aircraft then began to descend, so Green expertly maneuvered the aircraft to lower terrain, according to an Air Force release. “There are heroic things going on in our Air Force every day, and these two gentlemen epitomize that,” Spencer said. Both airmen said the mission would not have been a success without the dedication of everyone involved. Green credited his Air Force training for ensuring he and other airmen can continue to ably serve. Brownell was quick to point out that many other airmen helped them the day of the rescue, especially the two other crew members on the mission. “We are truly a team,” he said, giving recognition to all of his crew members, including the helicopter maintainers. “We can’t do it without them,” Brownell said. The Cheney Award honors an airmen for an act of valor, extreme fortitude or self-sacrifice in a humanitarian interest, performed in connection with aircraft, but not necessarily of a military nature. It is presented in memory of 1st Lt. William Cheney, who was killed in an air collision over Italy in 1918.